When I started blogging I did not have the first clue. Had someone given me the fabulous new book Blogging the essential guide I would have been massively relieved. if you are a new blogger I STRONGLY suggest you get this fab book . Erica and Antonia are successful bloggers and mumpreneurs and really a fountain of wisdom on all things bloggy. That isn’t why I would recommend them though. without getting lost in technical jargon. Erica and Antonia write clearly, succinctly and precisely. They advise you names to pick, ways to be inspired, even how to develop ecourses. They have walked the walk in blogging and they really know their stuff. 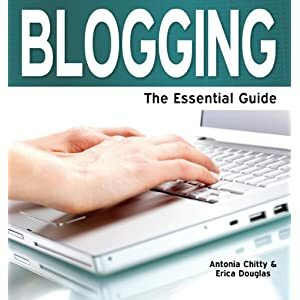 I predict this blogging this book will be a bestseller and hopefully lots more people will learn to love blogging too. Great value at £7 form Amazon. Just off to buy this one. I’d received the newsletter promoting it but the fact you recommend it to has sealed the deal for me.